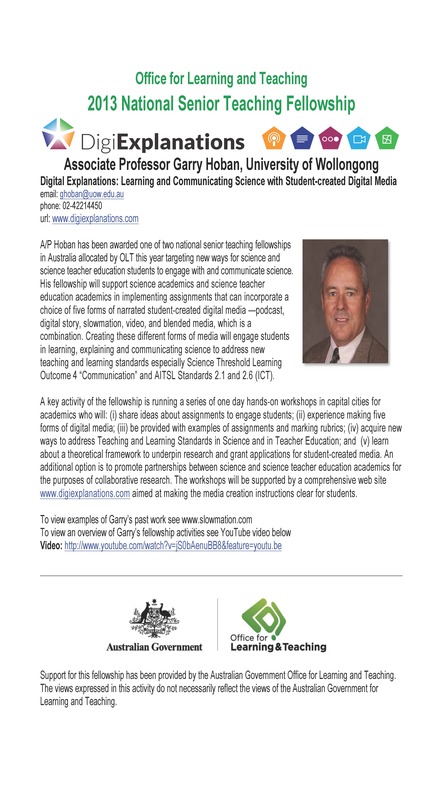 This is an invitation to Science, Applied Science and Science Education academic teaching staff to attend a one-day workshop as part of an OLT National Senior Fellowship, Digital Explanations: Engaging Students in Learning, and Communicating Science with Student-Created Digital Media (see flyer for details) to provide new ways for students to engage with content by making different forms of digital media to explain it. • learn about a theoretical framework to underpin research and grant applications for student-created media and meet colleagues for collaborative research. There is no cost for the workshop. Morning tea and lunch will be provided. Please indicate your interest in this workshop by emailing the fellowship manager, Julie Clark at julclark@uow.edu.au . Because of the hands-on nature of the workshop, spaces are limited so please reply ASAP to secure a place. Further details will follow upon application.